Fun pre-K and primary learning, links and resources for kids, parents and teachers! 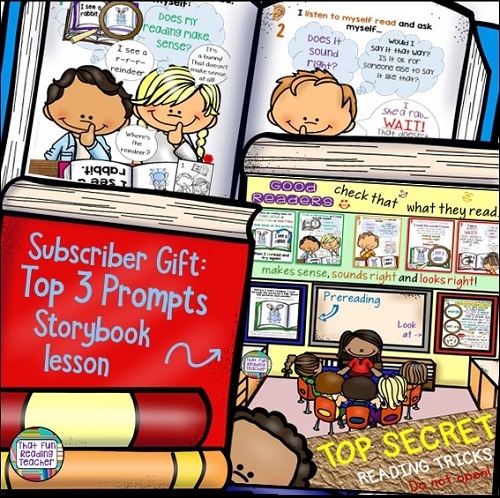 receive the latest blog posts and newsletters - and to receive your FREE subscriber gift - a ten page storybook lesson that can double as posters, based on my popular TpT freebie - The Top 3 Prompts for Beginning Readers! Come visit me on TpT! Canadian mom and literacy teacher sharing great content from years of fabulous on-the-job training, and the best of what I find on the web. Background in teaching kindergarten and primary grades, Reading Recovery and special education. Put up your feet and enjoy some Pinterest time! Follow That Fun Reading Teacher's board That Fun Reading Teacher's TpT Store on Pinterest. Seasonal Playlists for your classroom listening center! The Back to School sale goes on! Happy Father’s Day, and an inspiring story about a father reading aloud daily for nearly a decade! Before you go, be sure to subscribe to receive the latest blog posts and newsletters - and to receive your FREE subscriber gift - a ten page storybook lesson that can double as posters, based on my popular TpT freebie - The Top 3 Prompts for Beginning Readers! We respect your privacy and information.